(a) Manufactured from Hardened & Tempered High Carbon Alloy Steel and Nickel Chrome Steel Strips. Narrow Band Saw Blade : 10mm and goes up to 76mm wide. Wider Band Saw Blade : Above 76mm up to 250mm wide. 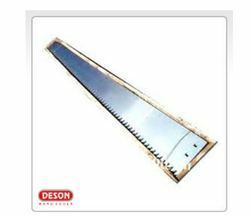 Ganesh Pit Saw Blades are made out from Best processed Hardened & Tempered Steel Strip. Pit Saws are available in Mirror, black and Satin (Rust Free Range) finish. Sizes ranges from 16 swg to 14 swg in thickness and 5 to 8 feet in length. 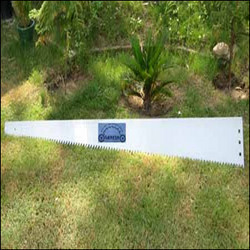 We are renowned firm that is engaged in providing Pit Saw Blade to our honored clients. To ensure their reliable performance and longer working life, these products are examined on different parameters of industry. Besides this, these products are obtainable in the market in numerous specifications that meet on industry demands.